From Goodreads ~ After Colin Campbell went on a short business trip, he returned home to discover his wife had moved out. No explanations. No second chances. She was gone and wasn’t coming back. Shocked and heartbroken, Colin fell into a spiral of depression and loneliness. 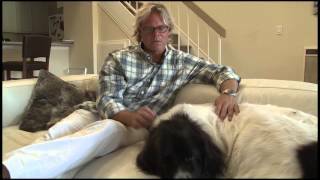 Soon after, a friend told Colin about a dog in need of rescue - a neglected 140-pound Newfoundland Landseer, a breed renowned for its friendly nature and remarkable swimming abilities. Colin adopted the traumatized dog, brought him home and named him George. Both man and dog were heartbroken and lacking trust but together, they learned how to share a space, how to socialize, and most of all, how to overcome their bad experiences. At the same time, Colin relived childhood memories of his beloved grandfather, a decorated war hero and a man who gave him hope when he needed it most. Then everything changed. Colin was offered a great new job in Los Angeles, California. He took George with him and the pair began a new life together on the sunny beaches around L.A. George became a fixture in his Hermosa Beach neighborhood, attracting attention and giving affection to everyone he met, warming hearts both young and old. Meanwhile, Colin headed to the beach to rekindle his love for surfing but when George encountered the ocean and a surfboard for the first time, he did a surprising thing - he jumped right on the board. Through surfing, George and Colin began a life-altering adventure and a deep healing process that brought them back to life. As their story took them to exciting new heights, Colin learned how to follow George’s lead, discovering that he may have rescued George but that in the end, it was George who rescued him. 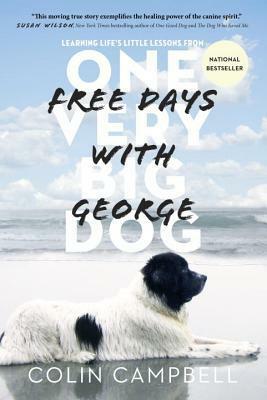 "Free Days with George" is an uplifting, inspirational story about the healing power of animals, and about leaving the past behind to embrace love, hope and happiness. I love reading books about animals and that's why this one caught my eye. When Colin's marriage unexpectedly ended, he was heartbroken and became depressed. A friend eventually suggested that he get a dog to keep him company. He found a 140-pound Newfoundland Landseer in need of home on a pet finder site online and adopted him and named him George. George had had a traumatic life up to that point and wasn't very trusting, especially of men. Over time, the two helped heal each other. When Colin was offered a job in Los Angeles, he and George moved from Toronto to a new life there. Growing up in Nova Scotia (that's where I'm originally from), Colin had been a surfer. 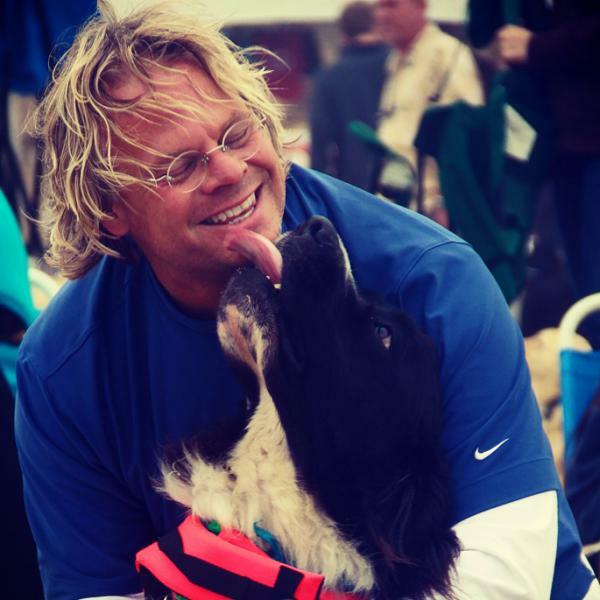 When he tried surfing on a beach near his home, he was surprised when George jumped in the water after him (the first time George had been near water) and tried to "save" him (his doggy instincts had kicked in). Despite trying to get George to stay on the beach, George stayed in the water with Colin and started jumping on the surfboard, catching waves, with Colin paddling behind. Thus began their surfing weekends and even doggy surfing competitions. I enjoyed this book. The story starts out sad with Colin's marriage breaking down but it ends happily with he and George making a life together and having adventures. I liked the writing style ... I found it flowed well. It was like having a conversation with Colin and he was telling me their story. There are lots of great pictures in the back of the book. The title comes from something Colin's beloved grandfather used to say ... "A free day is when you spend a whole day doing the things you love to do. And when you do those things with people you love who love you, you don't grow old that day. It's a free day." After two years in Los Angeles, Colin and George moved back to Toronto. I'll be keeping an eye out for them ... George will be hard to miss!